I have long wondered why various levels of land unit experience in Empire: Total War did not appear to increase unit statistics as listed on the unit card. In past Total War titles, there was always some correlation between unit experience and increased unit stats, typically reflected in increased attack, defense, and morale values. This correlation resulted in veteran troops which would possess increased battle effectiveness when compared to freshly trained troops of the same unit type. In Empire, this aspect of the game appeared to be missing. Units composed of veterans which had seen years of service and had obtained various levels of experience did not appear to possess superior statistics to units which had been freshly trained. In some cases, I thought I may have observed what appeared to be improved combat effectiveness by army units with one or two chevrons of experience over those with none. However, after comparing unit stats between these units on the campaign map and finding them to be the same, I quickly dismissed such thoughts as products of my imagination. Such passed my first several years of playing Empire: Total War. It was only upon beginning an analysis of the effects of the various bayonet technologies on unit statistics that I discovered that there indeed was a correlation between land unit experience levels and unit stats. This correlation was extremely hard to identify because the Creative Assembly, for whatever reason, made the upgrades visible only when the unit card is viewed on the battle map. This went undiscovered by me for so long because I do not typically pull up unit cards and view them while on the battle map. Logically, one would expect such upgrades to be visible on the unit card when viewed on the campaign map as well, since this is where all plans which will later result in enemy engagements are set in motion. Perhaps this is a bug, or perhaps this is one of the many slight details in Empire which seem to have been overlooked by the creators of the game. In any case, below are my findings in regard to the correlation between land unit (hereafter defined as army unit) experience levels and stat increases. In all cases I have thoroughly tested and verified my findings to ensure accuracy. An army unit card lists the type, name, number of men, level of combat experience, combat statistics, special abilities, recruitment and upkeep costs, and generic description of a unit. The unit card for any army unit can be viewed by right-clicking on the units’ portrait at the bottom of the screen. This card can be viewed while on the campaign map or on the battle map. Ranged unit types are defined as units which are capable of engaging the enemy at a distance by using weapons such as artillery, hand mortars, muskets, rifles, carbines, throwable hatchets, or bows. Ranged units will possess unit card statistics with listed values for range, accuracy, reloading skill, ammunition, melee attack, charge bonus, defense, and morale. Melee unit types are defined as units which are capable of engaging the enemy only in hand-to-hand combat by using weapons such as swords, pikes, and lances. Melee units will possess unit card statistics with listed values for only melee attack, charge bonus, defense, and morale. You will find that if you mouse over the accuracy, reloading skill, melee attack, defense, and morale values listed on any army unit card, a series of tooltips akin to the one listed in the below photo will appear, stating that these values can be increased by experience upgrades. You will find that the tooltips related to the range, ammunition, and charge bonus values on the unit card do not state that these stats can be increased through experience. I have confirmed that these areas are not affected by increased experience levels. Therefore, this guide will focus only on unit stats which can be upgraded through increased unit experience – accuracy, reloading skill, melee attack, defense, and morale. Levels of unit experience are reflected by the number of gold chevrons listed on the red ribbon located in the upper right hand corner of the unit card. Each chevron (^) indicates one level of experience. Below is a photo of the unit card for a regiment of Spanish Line Infantry which has no experience. I have found that each chevron of experience gained by an army unit results in +1 to melee attack and +1 to defense. In addition, ranged units receive +2 to accuracy and +2 to reloading skill for each chevron earned. Unit morale values are also increased with experience, although at a slightly different ratio. The first chevron of experience results in +1 to morale, after which every two additional chevrons will result in an additional +1 to morale. The below photo supports the above listed correlation between experience and army unit stat increases by illustrating the increased stats of a Spanish Line Infantry Regiment after earning one chevron of experience. These values differ from the original Spanish Line Infantry unit stats of an inexperienced regiment according to the effects of one chevron which I have listed above. In the below photo, we will examine the effect that two chevrons of experience have upon the statistics of a regiment of Spanish Line Infantry. Observe that these values also increase according to the effects of one additional chevron listed above. Let us now examine the effect of three chevrons on Spanish Line Infantry stats. Based on the above illustrations, we have confirmed that chevrons one through three grant +2 to accuracy, +2 to reloading skill, +1 to melee attack, and +1 to defense for Spanish Line Infantry. In addition, we have proven that the first chevron results in +1 to unit morale, with chevrons two and three combining to provide another +1 to morale. At the beginning of my research on this topic I believed that each chevron earned upgraded morale by +1. It was only upon noting that morale values did not change for units which moved from one chevron to two that I found this to be untrue. Further testing revealed that upon reaching the third chevron, morale increased by an additional point. However, the relationship between experience and morale did not appear to follow the same ratio as the other unit stat increases, leaving me unsure of the exact correlation between the two. I tested many theories, including one based on each chevron adding +.5 to morale, but none of these theories explained the initial +1 to morale when the first chevron was attained. In my search for answers, I was eventually forced to resort to attempting to access the main database files for Empire, something I had never done before. It was only upon doing so that I was able to finally confirm the relationship between experience and morale. This table was quite enlightening, and I wish I had located it much sooner as it would have saved me many hours of note taking and head scratching. 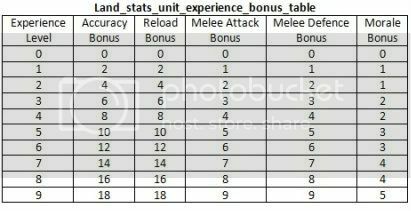 This table supports my own findings in regard to the effects of army unit experience on unit stats while expanding upon them to list the effects for all nine chevrons, something that I was unable to test empirically or to illustrate in this guide. The table above also definitively explains the correlation between experience and unit morale, which I had previously been unable to prove out to my own satisfaction. This guide illustrates that each chevron of experience for land units in Empire upgrades unit stats by +2 to accuracy, +2 to reloading skill, +1 to melee attack, and +1 to defense. We have also clearly defined the effects that chevrons of experience have on unit morale. The first chevron adds +1 to morale, while every two additional chevrons add +1 to morale. I have extensively tested the effects of experience on many army unit types within Empire: Total War and have found that the same ratio of stat increases per chevron earned applies regardless of army unit type or nationality. All Infantry, Cavalry, and Artillery units in Empire receive the above listed stat increases per chevron – although accuracy and reloading skill stat increases will of course not apply to units capable only of melee, and will only apply to those cavalry units which are able to fire from horseback. It is important to reiterate that army unit statistics will not reflect the effects of any experience possessed by the regiment in question when the unit card is viewed on the campaign map. Stat increases due to experience gains or technology upgrades are only reflected on the unit card when viewed on the battle map. I have found that whether the unit card is viewed while in the deployment phase or after the battle begins makes no difference. It is worth mentioning that unit stats can be affected by factors other than experience. A general who possesses a +4 morale bonus due to character traits or followers will add +4 to morale for any units under his command when unit stats for said regiments are viewed on the battle map. In addition, certain army technologies, such as the bayonet techs, affect melee attack values once the techs have been researched. It is important to take these modifiers into account when attempting to replicate my findings in regard to the effects of army unit experience on unit stats. I have found that understanding the correlation between army unit experience and unit statistics has enhanced my deployment strategy prior to battle and has improved my utilization of unit effectiveness while in battle. This understanding has also restored an element to the game which I believed formerly to be lacking, and has made both battles and campaigns much more intriguing and rewarding. I hope that understanding the relationship between levels of army unit experience and battle effectiveness will enhance your Empire experience as it has mine. Fire at Will! Copyright © 2019 HeavenGames LLC. All Rights Reserved. The graphical images and content enclosed with this document are viewable for private use only. All other rights—including, but not limited to, distribution, duplication, and publish by any means —are retained by Heavengames LLC. Federal law provides criminal and civil penalties for those found to be in violation. In addition, please read our Disclaimer and Privacy Statement. Empire: Total War © 2008 Creative Assembly. All Rights Reserved. This site is not endorsed by The Creative Assembly or SEGA, please read.